BENTON, AR - Saline County Sheriff Rodney Wright and Chief Deputy Jay Fitzpatrick presented annual awards to employees in five categories on Thursday, January 31st. Monica Kendrick (photograph 1) was awarded Civilian Employee of the Year for her hard work and dedication in the administration division, front office. Ms. Kendrick has taken on new responsibilities throughout the past year and expanded her job functions in order to be more helpful to other employees. Deputy Elisabeth O’Neal (photograph 2) was awarded Detention Officer of the Year for her display of exemplary leadership potential. Dep. O’Neal has exhibited a willingness to take responsibility for not only her work, but the work of her peers also. She has made great efforts to contribute to the training of others. Deputy Russell Caldwell (photograph 3) was awarded Reserve Deputy of the Year for his outstanding dedication to the Saline County Sheriff’s Office. Over the course of the past year, Dep. Caldwell has volunteered over 150 hours of time each month to assist in the Civil Process Section. Dep. Caldwell’s assistance with administrative work has enabled the other deputies in this section to focus on more field work. Sergeant Aaron Washington (photograph 4) was awarded the Medal of Valor for his courage and expertise while responding to a multiple-casualty incident involving a bus crash. Sgt. Washington arrived before any other emergency responders and single-handedly helped a number of children escape the overturned bus in which they were trapped. All of Sgt. Washington’s actions were taken at risk to his own safety. Detective Mike Lett (not photographed) was awarded Deputy of the Year for his hard work and overall knowledge and experience in leading criminal investigations. Det. 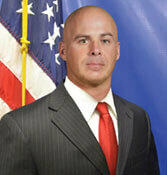 Lett has personally overseen numerous high-stress and intricate criminal investigations. His ability to lead a team of investigators has directly contributed to the successful conclusion of many of these investigations. At the conclusion of the ceremony, Sheriff Wright thanked each of the employees for their contributions and their dedication.